Our close friend Sonia of Mummy Loves kindly asked my little Addy to review a bib from DribbleBuster, please go to Sonia’s blog to see the full review and other awesome items in her Christmas Gift Guide. The lovely people of DribbleBuster recently sent us the most gorgeous floral designed Bandanna Bib for my beautiful little teething girl to put to the test. “Dribblebuster was started in 2007 when my first grandson was born, he was constantly getting chills on his chest from the dampness of dribble. I found that ordinary bibs didn’t really help the problem and besides they hid his lovely outfits. I have to say on first impressions I was surprised by how lovely and light the bib was, unlike some of the shop bought Bandanna Bibs. 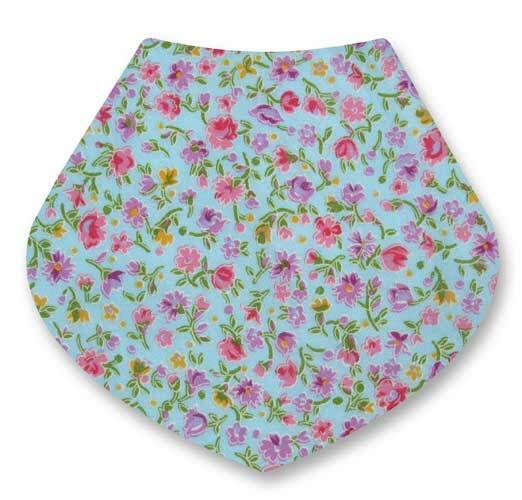 I was so pleased with the beautiful feminine design, I am one for a pretty floral print and the colours of the bib really looked lovely with Addison’s heavily pink wardrobe. Addison is drooling to major extremes, in the past month she had ended up with a little dribble rash and her clothes were being changed frequently thanks to her either soaking through standard bibs or ripping them off and drooling directly onto her clothes. The Dribblebuster bib did stop all of this. Although very thin, Addy wore the bib for over 5 hours and it never soaked through, thanks in part to the soft fleecing backing which felt so lovely against her skin. The bibs come with a Velcro fastening, which I am normally a little against, as Addison tends to pull them right off, but with the Dribblebuster that was not the case, the Velcro is very heavy duty but sewed in far enough so it doesn’t irritate little ones skin and I think the shear size of the bib meant Addison was not to interested in trying to rip it off and chew. I have to say all in all we are very pleased with the Dribblebuster Bib, it does exactly what it describes all whilst adding a beautiful touch to my daughters already styling outfits and I think at £7.99 each or 3 for £21.00 they are great value. Don’t forget to head by Dribblebuster’s website for many designs of Bandanna Bibs along with some great other products such as Sleeping bags and Sophie le Giraffe.